With a light fast racing catamaran, engine power isn't the first thing you would think of, but Catapult is also ideal for cruising, and this throws up the potential need to back this up with an auxilary. 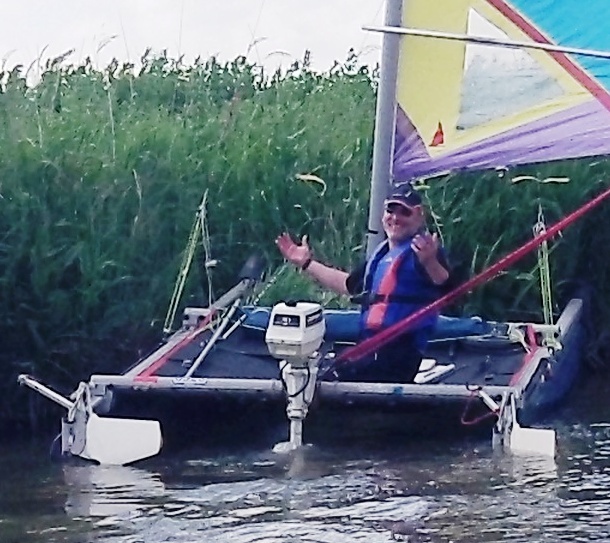 Below, five Catapults are negotiating the Broads in light breezes against the tide, towed by Chris with a 4hp outboard on the Broads cruise 2013 On the same expedition, Alastair's 2.5 hp engine towed one or two boats easily, so we are talking about small engines. Some engine-mounting options are looked at below. Below left. Alastair's engine mounting plate, sitting on the rudder pintles. This is secure and very simple to make. (The block does not rotate on the pintles.) There is no problem having the engine on one hull, as the slim hulls run true. 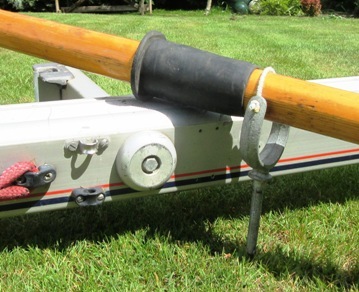 The engine has a lengthened tiller, and tiller extension, to allow weight to be well forward. Above right: Chris' engine is on a wooden plate and block clamped around the rear beam. It allows the engine to be put on and off while on the water. 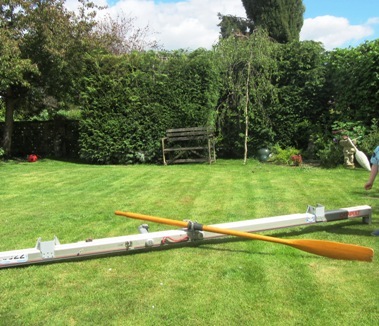 The tiller bar is removed. 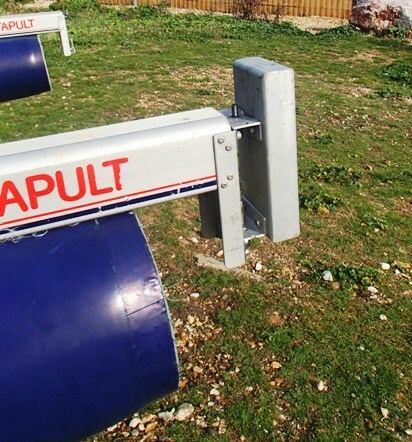 The potential diificulty is that the securing bolts for this sort of solution need to be very tight, to stop the mount rotating round the beam under load. 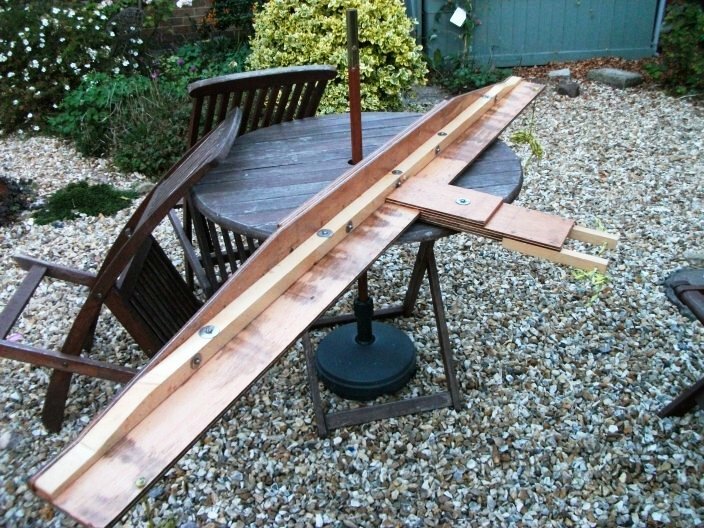 Rowing: Catapult also easily manoevres by rowing, (photos below) when the challenge is narrow spaces rather than tides. 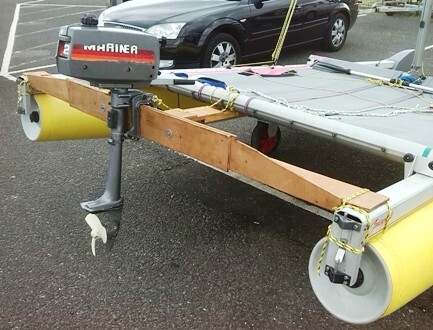 The rowlocks set up by Alastair for Thames cruising fit into fairleads screwed simply on the beams, and the width of the boat is just right, to scoot the boat along. The rowlocks are kept on the oars (as they could give a nasty injury left in the mountings!) and the oars sit easily-enough on the trampoline along the rear beam. The fore-and-aft position of the oars on the boat was guessed-at, to give a reasonable bows-down trim, and the boat moves very easily---but with the position well forward, rowing with the sail up is awkward, and so the oars are used with the sail furled, in locks and narrow sheltered channels where the breeze is masked..